Manners appear to me to be a lost art. Daily, I see oblivious, rude people living in my well-intentioned and mannered world. No one says “thanks” when you hold the door open for them. Or even smiles at you for that matter. Parents allow their children to interrupt and whine. No one responds when you say “good morning” as they allow their dogs to poop on your lawn. My peeps, known to the world as older people, tend to acknowledge a kindness and verbalize it. I hate to blame the young people, but from my vantage point it’s mostly them not showing any common courtesies. Aside from guidance at home, my kids learned “graces and courtesies” at school when toddlers. Simple things like handshaking, conversational skills, and general etiquette were daily occurrences and never taken for granted. These lessons were reinforced in their martial arts training. I used to believe every one else – at home, in classes and at activities – were doing the same. Based on what I see out in the world, these skills are no longer being taught, passed down or even expected. Is this the future? Will my grandchildren be surrounded by non-mannered brats? Will the next generation give up common pleasantries all together? 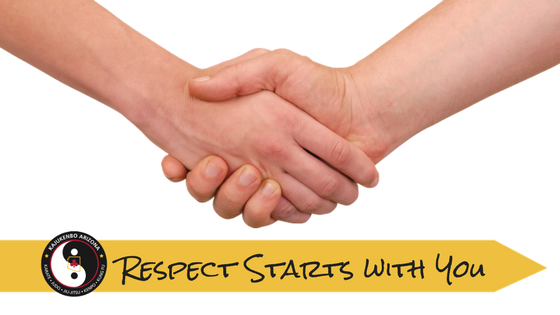 At Kaju AZ we believe in restoring the long lost art of manners…we call it Respect. It’s a part of every class, every day. Respect is black belt principle that all our students learn and internalize. “What does Respect mean?” The students provide a variety of answers that would make Emily Post proud. So hope is not lost. When the guy at the post office doesn’t say thanks after you helped him pick up his packages, or someone cuts you off rudely in traffic or the door is slammed in your face, feel free to hang with us at Kaju AZ. But be ready to be greeted with a handshake, introduction with eye contact, be called sir or ma’am and receive questions about your wellbeing. It’s what we do. And with practice, it becomes who we are. Aunty Jennifer Corder, an Arizona native, is co-owner of Kajukenbo Arizona with her husband Professor Kelly Corder, and sons Sifu Nicolas and Sibak Cameron. She graduated from Arizona State University with a degree in Family Resources and Human Development. She is a black belt in Kajukenbo with over 15 years of martial arts and self-defense training. She and her husband also founded Redrock Software Corporation in 1991 and enjoys working with her family in both businesses.